A young black haired boy ran through the streets, a grin on his face. Today was the day his father would finish his best work. He burst through the doors of a puppet shop to find his father sitting at the work table. His father turned and smiled. "There you are Gajeel!" his father called. The boy ran up to him. "Is she done?" The man smiled and picked up his son. On the work table sat a life size puppet. She was only slightly taller than the ten year old and had pale porcelain skin. Her limbs were thin and she had large brown eyes with long eyelashes. Wavy blue locks fell to her shoulders and framed her face and she had a small smile. Lines ran down each corner of her mouth where it could move to simulate speaking. She wore a simple orange gown that stretched I her knees. "Papa she&apos;s so pretty! What&apos;s her name?" The boy stared at the puppet with his red eyes. His father laughed. "A name? She is just a puppet." Gajeel shook his head. "No Papa she is too pretty to be just a puppet. She needs a name!" His father ruffled his hair." Well why don&apos;t you name her?" The boy thought for a moment before grinning. "Levy! Levy McGarden!" His father laughed and smiled. "That&apos;s a wonderful name." The boy grinned. "Some day I want a wife as beautiful as Levy!" "Your too young for that!" his father said. The two laughed as they heard the bell above the door jingle. A talk man with deep blue hair entered. He had a red tattoo over his right eye and he wore simply black pants and a long black vest. All trimmed in white. The man quickly stood and bowed. "Lord Siegrain, I am honored." The man nodded. And looked around the shop where different sized dolls hung made from wood, porcelain and even some small metal puppets. His eyes then landed on the blue haired one on the work table. "My my, she is lovely." he said as he approached. "Thank you my lord. This will be my last porcelain creation. I&apos;m getting to ill in my old age to fiddle with the kiln." The man replied. "Then she is indeed special isn&apos;t she?" Siegrain murmured. "Her name is Levy!" Gajeel pipped up. Siegrain looked down at him. "Levy?" "Yeah, I named her myself!" The boy grinned. The man was quiet as he looked back up at the doll." I will take her Mr.Redfox." Siegrain said as he reached into his vest and pulled out a small bag of money before handing it to the man. Mr.Redfox gently folded Levy into a case and handed her to Siegrain before bowing again. Siegrain left. "Papa, who was that?" 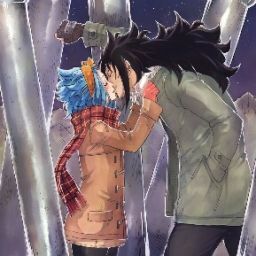 Gajeel looked up at his father. "That was Lord Siegrain, king of Magnolia. He is also known as the puppet master." The boy tilted his head. "Puppet master?" his father nodded. "He was amazing magical powers that can bring the dolls and puppets to life. His soldiers are puppets made of iron. The servants and maids are made of either wood or porcelain, like Levy." The boy looked at the door where the king had disappeared before looking up at his father. "Papa teach me!"